A registered nurse anesthetist is a type of nurse who specializes in the management of anesthesia during a surgery or medical procedure. They can be found in a range of health care facilities, such as emergency rooms or dentist offices. Certified registered nurse anesthetists (CRNAs) are also advanced practice registered nurses who have gained graduate-level training and board certification in anesthesia. The American Association of Nurse Anesthetists claims that an individual can become a CRNA after seven years of postsecondary education and experience. On average, students will have to finish nearly 2,500 clinical hours and administer 850 anesthetics before gaining a certificate of completion. People pursuing a career as a CRNA can achieve the needed experience working as a registered nurse for at least one year. Only then can they participate in an accredited program. A list of nurse anesthesia programs can be found on the Council on Accreditation webpage. Keep in mind that the programs are extremely competitive, so it is necessary to pay close attention to admission requirements before completing an application. Once the accredited program is completed, individuals must then pass the National Certification Examination. Below you can find the steps to becoming a CRNA. Obtain a Bachelor of Science in Nursing. Many accredited nursing anesthetics programs require individuals to have a BSN or other qualifying degrees. People must set goals for themselves that are achievable. Some accredited nurse anesthesia programs require candidates to have a 3.0 GPA or better. Some nursing schools have a created a program to help current registered nurses achieve a BSN. Acquire a registered nursing license. Each state may have some differences in the requirements. In general, an individual must pass an approved training program and the NCLEX-RN licensing examination. Examinations are carried out by the National Council of State Nursing Boards. Some of the topics include infection control, health assessment, and physiological integrity. Gain experience as an RN in an acute care setting. 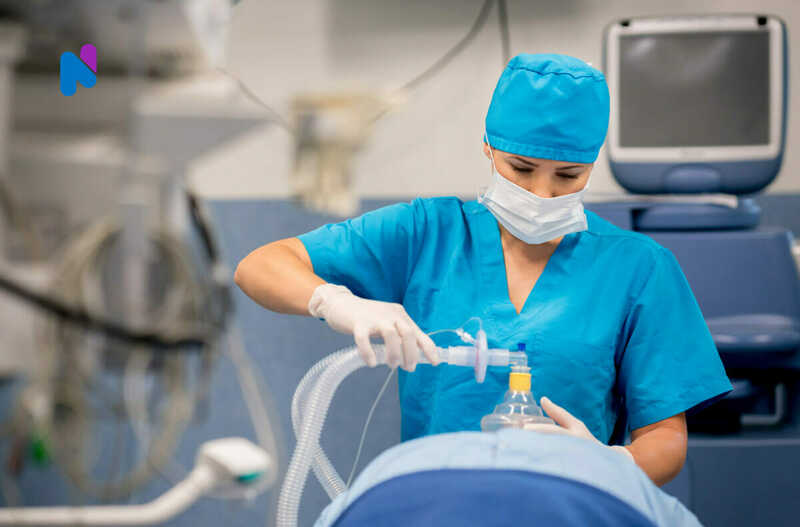 It is highly popular for applicants of an accredited nursing anesthetic program to finish at least one year’s work in a clinical setting, such as in an emergency room, intensive care unit, or cardiac care unit. Job shadowing can improve the chances of becoming a CRNA. Some RNs may want to get their critical care registered nurse certification to strengthen their chances of becoming a CRNA. Graduate from an ANAP. Every nurse anesthetist must finish an accredited program. These programs can take anywhere from two to three years. Most programs offer a master’s degree to participants in the program, yet a few of the programs award their students with doctoral degrees. Some courses include pain management, anesthesia pharmacology, and anesthesia pathophysiology. The programs also use clinical practice to aid students and expose them to a variety of procedures for children, adults, and seniors. Pass the National Certification Examination. After completing an ANAP, nurse anesthetists must pass the NCE to become a CRNA. The exam is taken on the computer and consists of 100 to 170 questions. It is generally completed in three hours. The test has a responsive design, which means each answer will cause adjustments to the remaining test material. Start a career as a CRNA. Some employers desire CRNAs who can work with several major departments, while others seek CRNAs with more specialized qualifications and experience in a specific department, such as pediatrics or endoscopy. Maintain certification. Nurse anesthetists must recertify every two years through the National Board of Certification and Recertification for Nurse Anesthetists (NBCRNA). The process includes having proof of a valid RN license, forty hours of continuing education, verification of work in anesthetics during the prior two years, and no mental or physical conditions that may interfere with the practice of anesthesia. While each state defines the education and certification requirements of nurses in slightly different terms, the job setting defines the nurses day-to-day duties. If you are interested in becoming a CRNA, take advantage of the many resources available online. The American Association of Nurse Anesthetists offers some tips on how to become a CRNA. A list of nurse anesthesia programs can be found on the Council of Accreditation site. The National Certification Examination can be found here at the National Board of Certification and Recertification for Nurse Anesthetists.